Nostalgia is not my strong suit. Most family rituals, in my experience, long outlive their usefulness. The enthusiasm small children grant to celebrations fades rapidly as the big world pushes in, perhaps especially in the case of Christmas when small children have learned to view any delay in present-giving as an injustice. 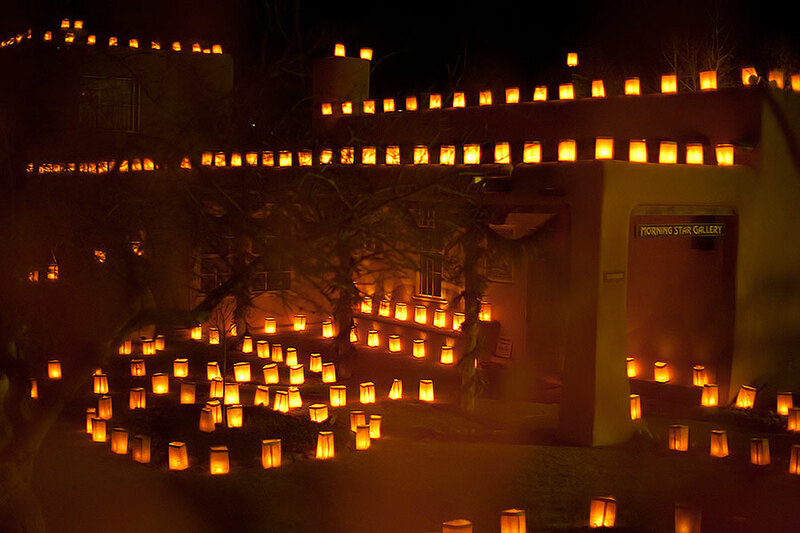 In my old neighborhood here in Santa Fe, Canyon Road is thronged for the Christmas Eve walk, with farolitos and bonfires lighting the way as the crowds surge in, it sometimes seems from all corners of the earth. The Walk was originally useful to neighbors making their way over snow and ice to the Christmas Eve midnight service at Christo Rey Church. It’s safe to assume that none of the revelers now consider the church their goal. But they sing carols, strangers gathered around in door yard fires, carols some of them may have sung as children. We didn’t sing carols at home when I was growing up in Kentucky, but we often put on plays; Christmas Eve was our mother’s birthday. She would be 108 years old if she was alive today. Nearly always, the play was my adaptation of Charles Dickens’ Christmas Carol, with our father rattling car chains in the basement as the ghost of Scrooge’s partner, Joseph Marley. Father read the story out of one of the handsome leather bound 1900 Complete Editions my sister sent me recently. The front page is a copy of the first page of the story, in Dickens’ cramped handwriting, with some crossings out and additions. Dickens sometimes indulged in nostalgia but often he was delightfully cold-blooded, which shocked and attracted me when I was a child. Marley had been Scrooge’s partner in their law firm for many years, but after Marley’s death, “Scrooge was not so dreadfully cut up by the sad event, but that he was an excellent man of business on the very day of the funeral, and solemnized it with an undoubted bargain”—of which Marley, also an excellent man of business with ice water in his veins, would certainly have approved. 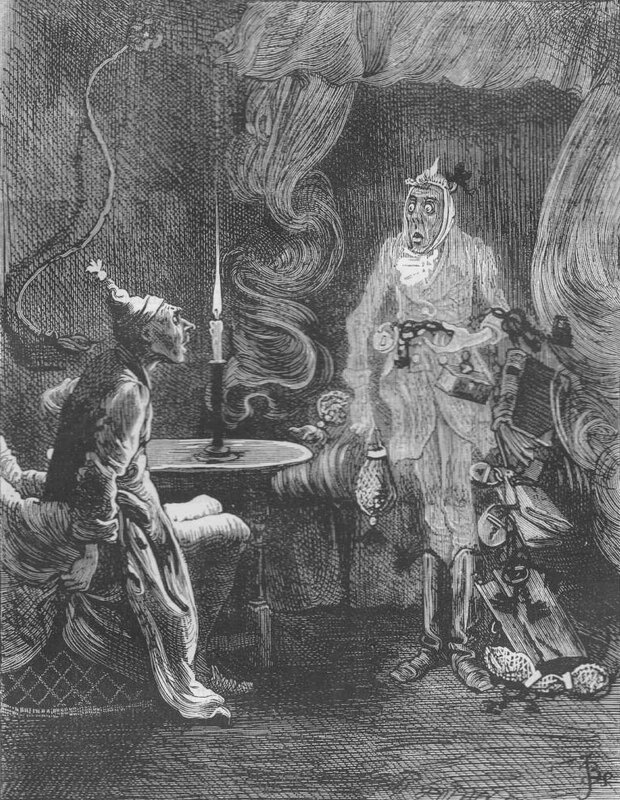 With its outstretched hand, it points to Scrooge’s own corpse, being stripped of its garments by predatory attendants who even steal the curtains off his bed. At this dreadful spectacle, Scrooge asks if there is any way to change the future. It is changed by his own change into a charitable man. The description of this third ghost, in my father’s voice that always relished terrifying his children, caused the younger ones to scream with terror. This Christmas Eve, two of my three sons and I, with the two blessed new members of the family, will be reading this story aloud from the big leather-bound book. How appropriate it seems in this haunted time, to start the celebration with this bitter potion, never entirely sweetened, to my mind, by Scrooges’ repentance of the appearance, for Tiny Tim’s family, of a Christmas goose. 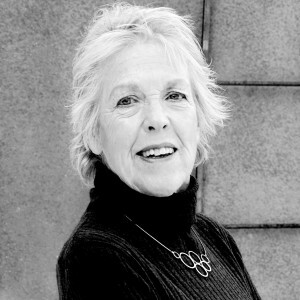 Sallie…this is a wonderful piece; richly bittersweet, as these times so call for, spiced with the subtle Christmas terror of A Christmas Carol!